Find out how this school bus module helps parents stay relaxed on kids’ safety while they are away to school. Parents send their children off to school on the bus and wait for them to return at the end of the day. When you ask a parent what time the bus drops their child off at home, they typically give a range of times. With school bus tracking, both the parents and the school system can see where the bus is at any given moment and get an estimate as to when the bus will arrive at a stop. This benefit is easily tracked using an iOS or Android app that parents can download to their smartphones and check at their leisure. One benefit is that parents can make sure that they are always there when the bus arrives to pick up their child. This lowers the chances of a child abduction. Sometimes, the bus runs ahead of schedule, especially if some children aren’t on the bus that day and certain stops aren’t needed. When parents can check the estimated time of arrival of the bus at their child’s stop, they can adjust their schedule to be there whether the bus is early, on time or late. GPS bus tracking can be set up by the school and individual parents to notify them of any changes to their child’s routine. For instance, the child swipes the RFID device when they get on the bus and again when they get off the bus so that the school and parent can know exactly which bus the child boarded and the stop that the child got off at. This lets the parents know that the child is safe and on the correct bus. The RFID system can also be setup to send an immediate message to the parent and school of any unusual activity. These messages can include: a message when the child gets on the wrong bus, doesn’t get on the bus or gets off the bus at the wrong stop. This helps the child’s parents understand that there is a problem in real time and make the necessary arrangements to correct it. It allows parents to make sure that their child isn’t at a bus stop alone and scared for very long since they know where the child was dropped off and can go there quickly to pick them up. This helps to keep each child safe. The system can also notify parents right before the bus arrives for pickup in the morning and drop off in the afternoon. This helps parents and students avoid missing a bus that is a few minutes early or avoid standing outside in cold or rainy weather when the bus is running late. The text or email arrives that the bus is almost at the child’s stop, and the parent ushers the child to the stop as the bus arrives, providing the most convenience and safety possible. In some cases, a parent may want all or just a few of these notifications. This RFID system is designed to allow each parent to set up exactly the notifications that they want and how to receive them. The options for receipt include text, email, SMS or a combination of the three. In this way, they pay more attention to notifications instead of just glancing at them because they receive constant information. In most cases, there’s a simple explanation for why a child got off at the wrong stop or missed the bus, such as a visit to a friend’s house or a doctor’s appointment.However, if there isn’t a simple explanation, this system allows parents, school officials to spring into action immediately to protect the child and keep them safe from harm and strangers. 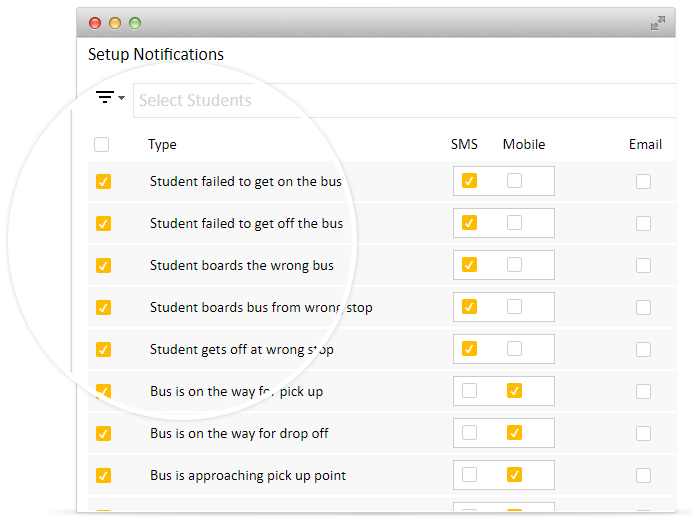 If missed anytime out of the 4 times (on a daily basis) in school bus attendance system, you’ll receive immediate mobile notification on absence, so you could take sufficient measures to make sure your kids are safe.